You need to know how fare a part are to Geographic or decimal coordinates? This app will calculate for you in Mile, Nautical Mile, Statute Mile or Kilometer. You also can save places in your data base, and re-use the name for calculate a distance. You will be able also to convert Geographic to Decimal coordinate. 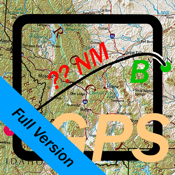 -This is the link to the free version of "GPS Distance"